"Danger! Danger, Will Robinson!" From the furthest reaches of space come the coolest Minimates of all with the Lost in Space Dr. Smith and B9 Minimates 2-Pack! 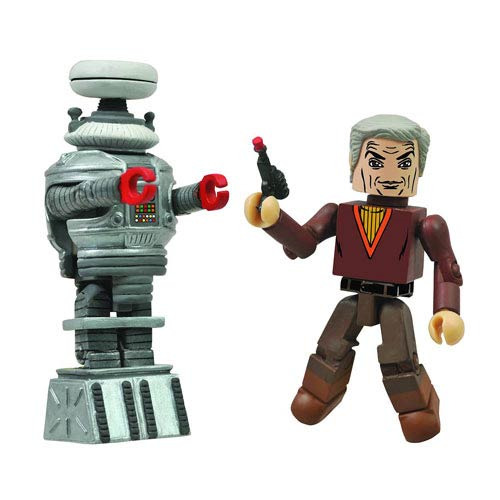 Based on the classic sci-fi TV show Lost in Space, these 2-inch tall mini-figures of the famous Robot B9 and fan-favorite stowaway Dr. Zachary Smith feature a variety of interchangeable parts and accessories, including a laser pistol and 3 interchangeable Dr. Smith heads. Designed and sculpted by Art Asylum, Dr. Smith and B9 sure pack a lot of punch for 2-inch figures! Ages 8 and up.